How defined is your e-commerce conversion funnel? If your not growing sales, you need to peek into one (or more) of your funnel levels. You may have a pretty good understanding of the general marketing flow: acquisition, nurture, conversion…but what tactics are you using at each level to make sure you’ve built the highest-performing funnel possible? 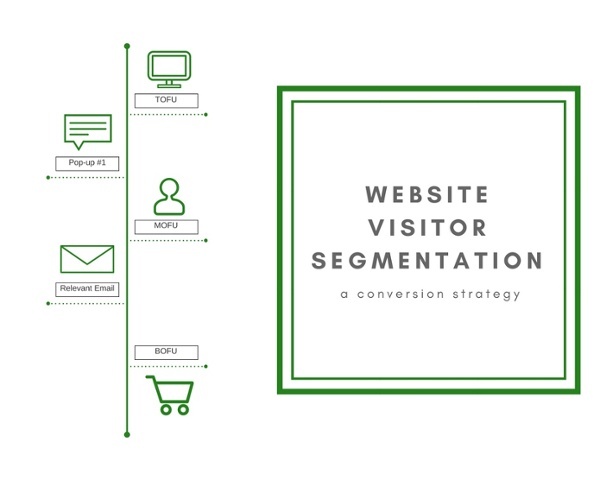 A basic e-commerce visitor segmentation strategy can quickly improve your conversion funnel and provides a great starting point for optimization throughout your site. Whether you’re new to segmenting or you already have several customer segments defined, let’s start by examining the top of your funnel to illustrate exactly how segmentation can boost your revenue. Filling the top portion of your funnel is what we call lead capture or customer acquisition, AKA when website visitors opt-in to your email list. You have all types of traffic coming to your e-commerce site: organic, social, paid – and within those groups there are different customer personas (ideal customers, not-ideal customers, high-intent, no interest, etc.). We recommend our clients try and get 5% of their total traffic to opt-in. Here at Justuno our number one recommendation to every e-commerce site to help them achieve that 5% benchmark is to set up a new visitor pop-up. This is the bare minimum of what needs to be live on your site right now. If you don’t have something set up to capture new visits, hitting that 5% mark is never going to happen. Capturing new visitors allows you to get your feet wet with segmentation and is relatively easy to set up and understand. Once you capture new visitors, you can target them with an automated New Visitor Welcome email campaign (more on that below) and that’s the start to a targeted marketing campaign. With this type of offer, you’ll be up-and-running in no time! But to be really smart about it and get started with segmentation early, you should set this offer up with a few specific targeting rules to level-up your segmentation from the very beginning. You can easily gather more information on the people opting-in to your offer than you may think. Setting up more advanced targeting rules can help you inform your marketing campaigns by telling you: who is opting in and where on your site they’re doing so. Knowing this information, you can transition into sending emails that are personally relevant according to the data you just collected. These are just a few examples of how you can use targeting rules plus an offer to segment. But there are TONS more examples of campaigns that you can create for your email marketing. To see a thorough list check out this blog post. Now that you know something about the people who’ve opted-in on your site, you can funnel them to the best segment or list inside your email service provider (ESP). Segmented and targeted emails generate 58% of all revenue. Email has an ROI of $41 for every dollar spent compared to $12.71 for Social Media and $22.24 for paid search. These stats are significant because not only is email the most personal channel for marketing, but delivering a relevant, targeted email in such a manner packs a powerful conversion punch. Using one of the targeting rules from above, i.e. if you know the page where the visitor opted-in, you can use that information to inform which list they’re placed on and what the content of your email marketing campaign should be. For example, if your website visitor engages with or opts-in to your New Visitor offer on your men’s shirts product category page, you can send them to a Welcome Campaign supplemented with your men’s shirts best sellers at the bottom. 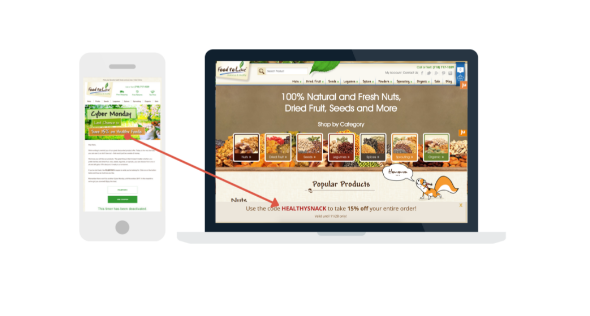 See how adding a single personalized aspect can power up your email marketing efforts? This can help push your visitors from MOFU to BOFU. Now that we’ve clarified how middle of the funnel segmentation can work, let’s explore how that MOFU marketing impacts the users who have a high intent to purchase (BOFU). Now what happens when they click through to your site? This is where most of you are missing the final step in creating a funnel that converts – your on-site experience. This final step is the most important, yet most overlooked. Your on-site experience is where the user will make their purchase decision! Don’t waste your effort in creating an offer and tailored email campaign, only to funnel them to a site experience that’s NOT optimized for conversion! What can help optimize your site? 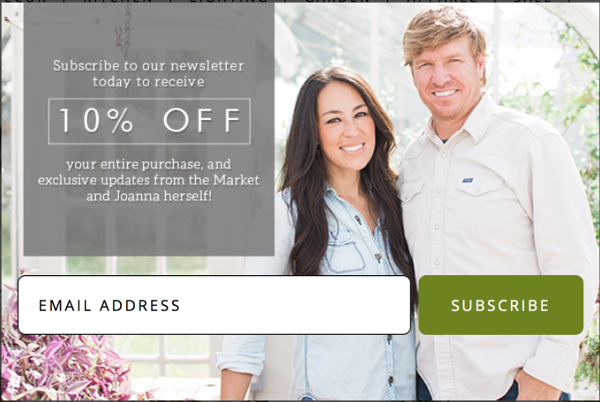 Once your user clicks through from one of your men’s shirts recommendations, obviously the optimal destination for the visitor would be that product’s page. But, if they don’t see their Free Shipping offer on this PDP, they may lose their motivation to buy. By mirroring the email message on-site, your user is more likely to stay focused on what you want them to do: BUY. Another example of a common promotion in the BOFU is an exit promotion. This is when a customer has added items to their cart and is displaying behavior that indicates they are about to leave your site. This offer will yield immediate results by closing sales and adding revenue that otherwise may have been lost. You’re catching these visitors at a critical point, perfectly timing an offer to help get them to the finish line rather than closing the window. Just like your new visitor campaign, you can send your exit promotions to a specific list inside your ESP. If you want exact strategies on WHAT email marketing campaigns to set up and WHEN to send these emails watch this replay of our recent webinar. Biz Tips: Should I Use Pop-Up Forms on My Website?